Spiced grilled chicken is a versatile summer recipe. Chicken breasts, thighs and drumsticks are generously coated in ground cumin, cayenne pepper and ground coriander before being charred on the grill. For this recipe, use the freshest spices you can get your hand on. Or better yet, grind them yourself in a mini food processor, coffee grinder, or blender. Spiced grilled chicken can be served with a variety of sides including a fresh green salad, grilled vegetables, rice, or even French fries. * Note: Use chicken thighs, drumsticks or breast pieces with skin and bones. Pat the chicken dry and put it on a plate. Combine the olive oil, onion, coriander, cumin, cayenne and 1/2 teaspoon salt in a small bowl. Rub the mixture evenly on all sides of the chicken, and inside a whole chicken. 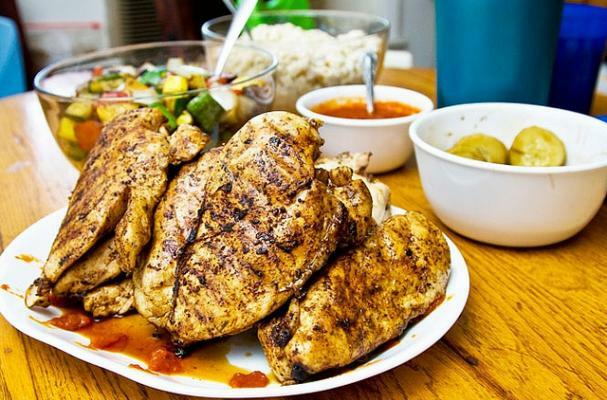 Let the chicken stand at room temperature to marinate briefly while you heat the grill; or cover the chicken and marinate it in the refrigerator for 2 to 4 hours. If using a charcoal grill, heat the coals until they're covered with gray ash and have only a hint of red; then move them to the edge of the grill. Preheat a gas grill for indirect heat according to the manufacturer's instructions, then reduce the heat to medium (350 to 375 degrees). For a whole chicken, put a drip pan in the grill's center so it will catch the bird's juices. If the grill grate is adjustable, set it 6 inches above the coals. Serve the chicken pieces with lemon wedges and mint sprigs. Let a whole chicken stand for 10 minutes before carving.